Leave your occupied country, and your family, for an outside chance at a better life. Know that in doing so you will see neither again for many years — if ever. Or stay, and see your whole life stretch ahead of you, a prisoner in your own land. Tendar Tsering was a member of the multimedia class I taught at a journalism school in Bangalore, South India, in 2010-11. He was a quiet, sensitive lad; a little tongue-tied due to his limited English competency, though clearly very intelligent. It’s been a pleasure to follow his journey over the past half-dozen years from India to America, where he recently got his conditional green card and has been making a living as a freelance journalist. 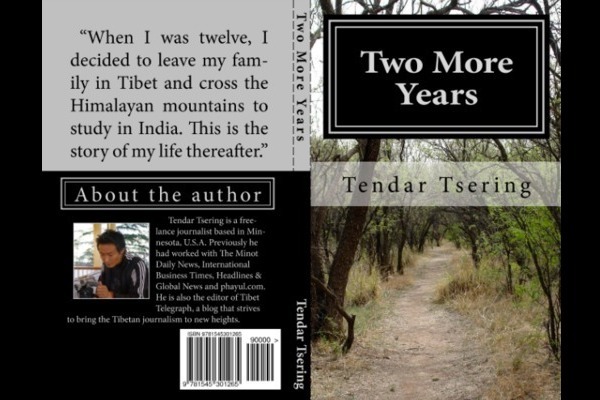 But Tendar undertook a far more arduous and dangerous journey when he left his home country of Tibet — one he recounts in his gripping memoir Two More Years, whose title is a melancholy reference to the promise, living in exile, he has made to his parents, time and again, over the phone when they begged to see him again — one he has yet to be able to keep, two decades later. When he contacted me a few months back to ask me if I would review his self-published book, the first thing I noticed was how much his English had improved. The second thing was how determined he was to tell the story of his departure from his beloved homeland, where sinicization has been accelerating for the past several decades. Tendar was born in a village in northeast Tibet where no one had a clock or watch, and time was told by hearing a rooster’s cry or looking at the shadow cast by a stick. Aged 12, his father, a monk, asked him if he wanted to go to India. The question came without warning. If his father had mentioned the plan before, he knew his son would tell his friends, and the family might be jailed by the Chinese police. Within two hours, he was on his way to Lhasa, where he joined a party of around 40 other young Tibetans making the long, perilous trek to India. From Lhasa, they made their way to Shigatse, in U-Tsang Province, bordering Nepal, walking at night and sleeping during the day, hiding from other people for fear they might be spies, or might talk to spies. To enter Nepal meant crossing the mighty Himalayas. It was a journey not everyone would complete. Two More Years is a moving page-turner. The sometimes awkward English never hampers its author’s powers of description; rather, it heightens the reader’s engagement and sympathy with him. There may be more polished accounts of what it requires, and what it means, to escape from Tibet, to make a life as an exile, but surely none more heartfelt. Mark Austin is a Japan-based senior journalist and former visiting professor at Indian Institute of Journalism and New Media, Bangalore. The book Two More Years is available on Amazon and can be also ordered from Barnes and Noble.